There are so many facial skincare products on the market now in the form of creams, lotions, gels and serums. They all purport to do marvellous things like moisturise, firm and lift, fight ageing and reduce the appearance of fine lines and wrinkles. It is true to say that some of these products are very sophisticated and often they do make a difference. A good moisturiser can soften, smooth and plump out the skin, resulting in a glowing, healthy and more youthful appearance and some makeup products are almost like a temporary mini-botox treatment! The only thing is that these generally contain chemicals and animal products, which are not always suitable for those who suffer from allergies. Then there are people who are simply uneasy and wary about applying these ingredients to their skin. In recent years, the market for hypoallergenic and "free-from" (and often vegan) skincare and cosmetics has grown and there are now some good brands offering these products. At my recent visit to the Allergy & Free From Show, I visited the Neals Yard Remedies stand. Their skincare products are all made from natural, organic ingredients and are free from chemicals. I came away with some little sample sachets of skincare products to review. As these were small samples, each lasting for a few days, I can only really comment on their short-term performance and not on any benefits of ongoing use over a longer period. 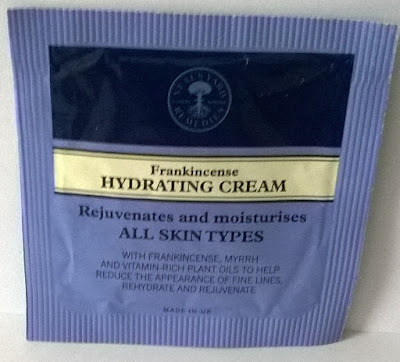 I began with Frankincense Hydrating Cream. This moisturising cream is intended for all skin types and contains jojoba and almond oils, aloe vera and frankincense and myrrh oils. As I applied the cream, the first thing I noticed was the unusual smell. Initially, it was like I was walking through the woods but then it mellowed into that pleasant scent of incense burning in a church. My skin instantly felt and looked moisturised, smooth and plumped. 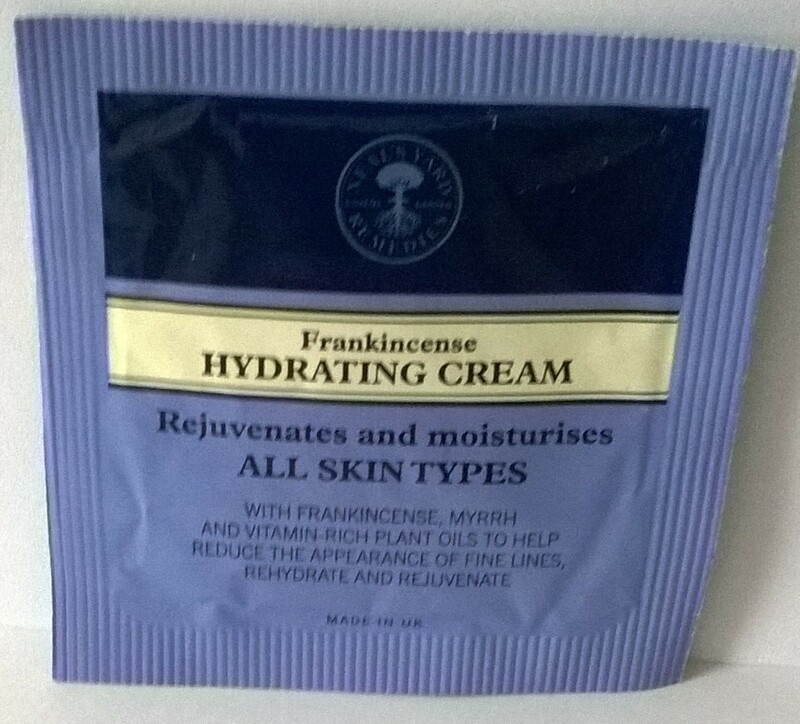 I found this to be a delicious and rich cream but if used in the long term, I think it might be most suited to skins that require quite a high degree of nourishment. For me personally, it would be lovely as a "remedy" or treatment sometimes when needed. 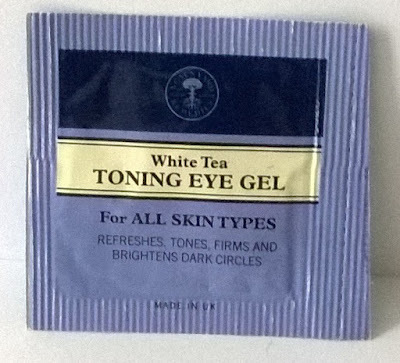 Next, I went on to try White Tea Toning Eye Gel. Recommended for all skin types, it contains antioxidant White Tea and is intended for use on the delicate area around the eyes to firm and improve the appearance of dark circles. As I do have dark circles under my eyes, I applied the gel gently with my fingertips as suggested. Certainly the gel did give a refreshing, cooling and soothing feeling and I think it reduced any puffiness. It didn't really dispel the dark shadows but, to be fair, I only used it for a few days. Possibly, longer use may have had more effect although, in truth, I think coverage with cosmetics is the only real answer here for me! 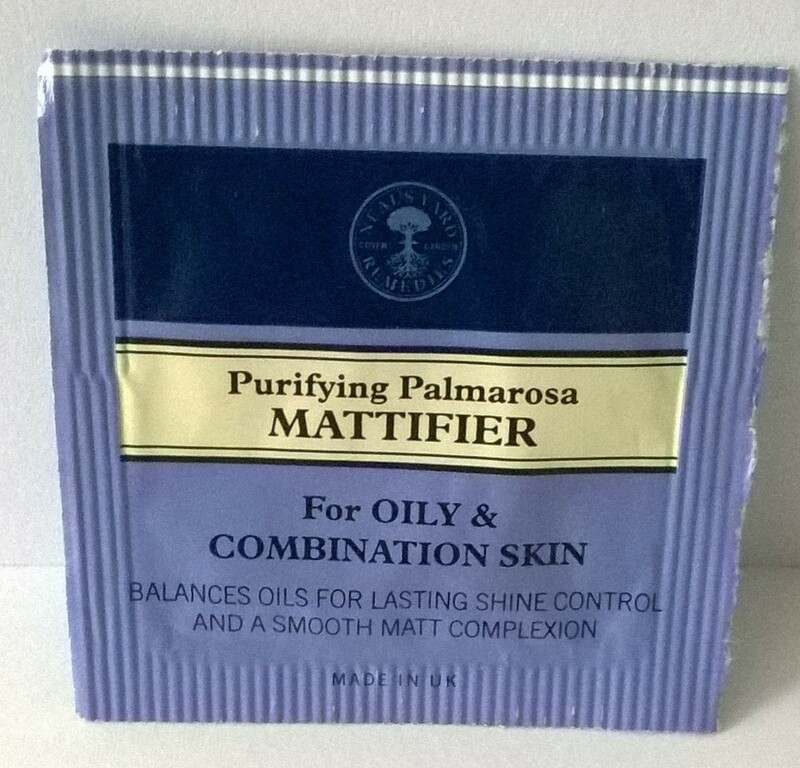 Purifying Palmarosa Mattifier is a serum containing purifying organic palmarosa and mattifying kaolin clay, designed to balance oils for oily, combination and blemish prone skin. My own skin is quite mature and not normally oily but almost as if by coincidence, there happened to be a blemish on my forehead. After cleansing, I carefully massaged the serum into the blemished patch with my fingertips. It had a fresh, lemony smell and afterwards the area felt like it had been gently cleaned. 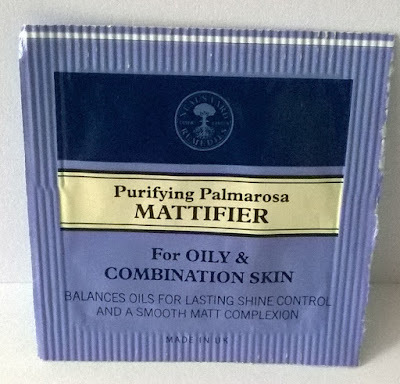 After using the mattifier for a few days, my forehead was looking much clearer. 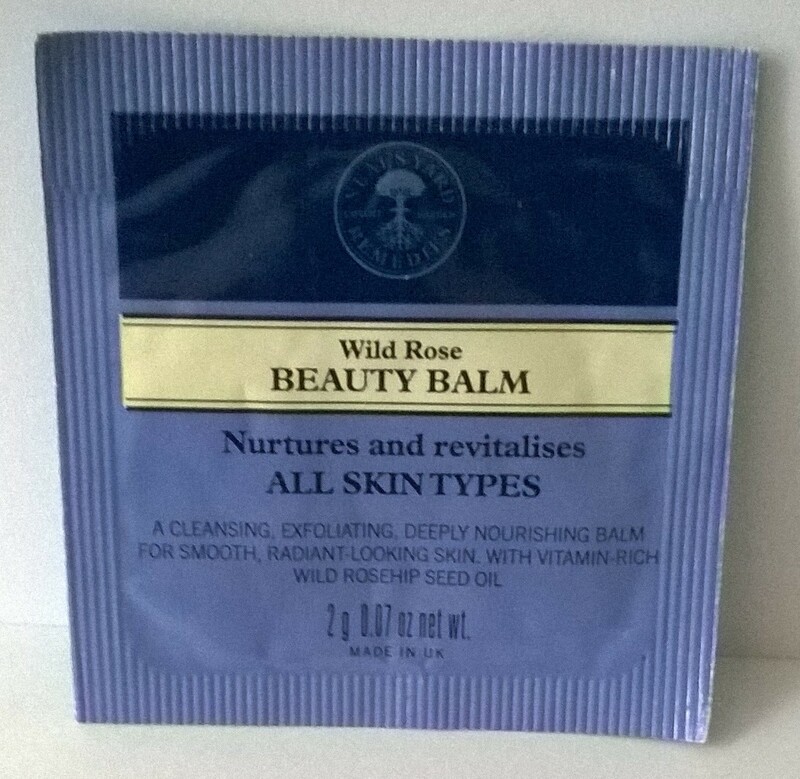 Finally, I tried the Wild Rose Beauty Balm. Neals Yard offer the balm as a multi-purpose product and I decided to try it for three of their suggested uses - as an intense moisture boost, a lip balm and as a cleanser. 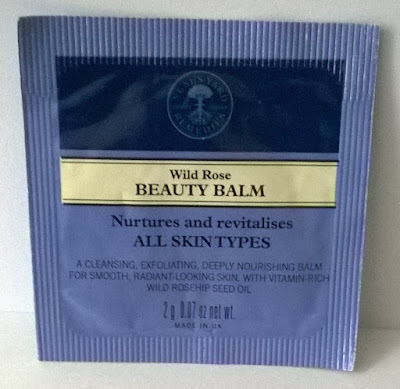 Wild Rose Beauty Balm contains vitamins and antioxidant-rich wild rosehip seed oil. I would describe the texture as syrupy and the lovely scent as rose/herbal. As an intense moisturiser, it did leave my face looking glowing and healthy but although it is intended for all skin types, I feel it would be a little too oily for my skin if used on a regular basis. Again, like the Frankincense cream, it would be more suitable for me as a special treatment. As I do get dry lips sometimes in extreme weather conditions, I think it would be a very good lip balm for me at those times. Last night, I used the balm as a cleanser and it was effective in gently removing all my makeup. My overall opinion is that this product is most suitable when an extra moisture boost is needed. As can be seen from the prices given above, these skincare products are very expensive compared to some other good brands. That said, they are all good quality products, carefully made from natural and organic ingredients and invitingly presented in nice containers. Also, a little does goes a long way so they should last for quite a long time. I did find it to be a very pleasurable experience to use these products because of the feel of the rich textures and the lovely floral/herbal scents.